Continuum has wrapped its fourth and final season on SyFy, and Simon Barry has been making the rounds to talk about the finale and a potential future for the series and its characters. He teased the chances of the series continuing in a movie or another format in an interview released over the weekend. Now he has also spoke about the ending of the series with Blastr. The finale saw Kiera returning to her time, but since she had fixed things in the past – there was no place for her in the timeline. She was already there. Barry spoke about that decision in an interview with Blastr. As for the spin-off potential for the series, he teased that once again, and he revealed more about one idea he would like to explore more with a new project. 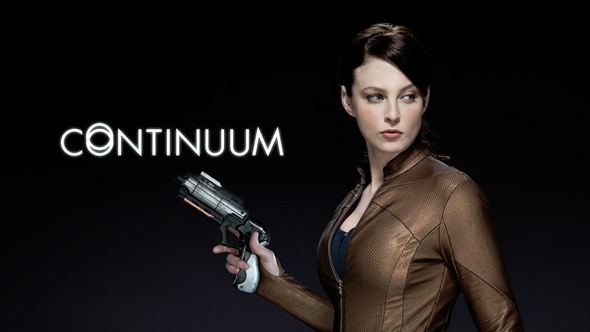 What did you think of the ending of Continuum? Were you happy with the bittersweet ending? Tell us what you think. hit by Lightning. He waits there with his time ball until it is hit by lightning and is then sent forward in time to the place where he left. Where he causes people in the future to start disappearing. A team is sent back to find him etc etc. Including the protector in a bikini. I am a chick flick kind of girl and bittersweet endings make me cry. I wanted a totally happy ,everybody gets what they deserve, ending. I can understand the final episode and why Keira doesn’t get Sam but… It doesn’t make me any less sad. Regardless, I love this show and need more of Keira’s story. We all know that Kellogg is totally screwed and I love it! I just want more of Keira’s story please!!!!! What would’ve been your happy ending to the story? through the years, here and there, where our old characters are in their lives. While always having knowledge of and sights of her son. Maybe even meeting him as his mother’s twin sister who is a time traveler. Giving her, her due. I really did enjoy this series although I did think there would have been a happy ending without thinking of the consequences of changing things. I feel so sad for Keira, all she wanted was to be with her son and that will never be. I was hoping she and Carlos would get together. I do hope we can come up with another party of continuum. Great show. but think about this they also ended it quick with an open like ending but at the same time it wasn’t. There cannot be two people in and of the same timeline. So when you think about it someone has to go. Yes but when you think about what he said in articles like this you second guess that with they ended it quick so Keira could do anything to her other counterpart just to be with her son. True, she could easily do away with the other Keira, especially as the other one has no special ops training. It would be interesting to watch, no doubt. But one thing Keira has is spades is compassion and a moral compass that would never allow her to do that, I think. Even Alec, whose moral judgement has been less than impeccable at times, had a hard time deciding what to do with his other, evil self. I missed the last series as it was not advertised enough or at all. down to a minimum so we can understand what we (I mean you) are talking about. show up to the point multiple time lines intervened.